I normally wait until I have reviewed and processed all of my images from a photography outing before posting them to my website and blog, but I am so excited about seeing and being able to photograph a Great Horned Owl that I want to share it right away. The above Great Horned Owl was photographed at Paynes Prairie Preserve State Park, Gainesville, Florida, yesterday (December 15) at sunset. When I arrived at Paynes Prairie, I heard the owl hooting in a heavily wooded area near the entrance to La Chua Trail. I have heard Great Horned Owls in that location many times during visits to the Prairie over the last few years, but have never been able to see or photograph them. I was hoping this visit would be different. I was down the trail photographing wading birds in the setting sunlight, when the two Paynes Prairie volunteers, that were working the visitors trailer, came down the trail to tell me about the owl. I quickly shouldered my camera gear and hustled up the trail to where the owl was spotted. Unfortunately, it was far away and across the large sinkhole along the trail and perched on top of a very large dead tree. Although far away, its very small silhouette was unmistakeable as a Great Horned Owl. I positioned and aimed my Nikon D800 with a Nikon 600mm lens and TC14 teleconverter, and using the manual mode, I began photographing the owl. I adjusted the camera’s settings a number of times as the light changed and tried to keep the ISO setting as low as possible while maintaining an appropriate shutter speed. Fortunately, the owl stayed on top of the tree, while I fired off a number of shots and only quit when it was too dark to get anymore images. I will eventually process more images of the owl, as well as other images of sunrise and sunset on the Prairie and the other birds that I photographed. I expect to return to the Prairie, as well as other refuges and preserves over the next few weeks. In the meantime, I hope you have a wonderful holiday season. Mine certainly has started out very well. 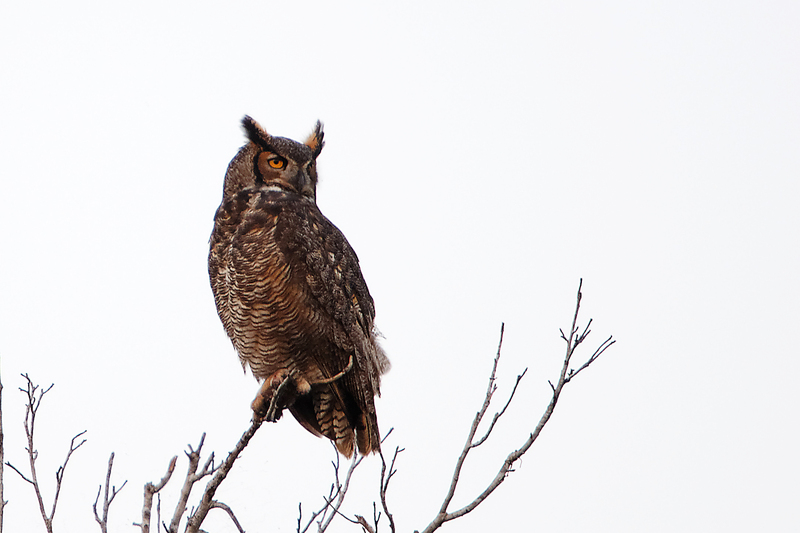 This entry was posted in Bird Photographs, Nature and tagged Great Horned Owl, paynes prairie preserve state park. Bookmark the permalink. Normally, the early bird catches the worm. In your case, you’re not only early but persevere and as a result you capture great images we can all enjoy without treking into the woods. Thanks. Fabulous capture, Steve. The late-day sun shining on the owl is a beautiful moment in time. As always, thank you for following my blog and taking the time to comment. It was a special moment, but one I hope to have many more times. What an amazing photo of a gorgeous bird!!! He looks so majestic! Can’t wait to see more! Hi Steve – what wonderful fortune! I have been looking for owls for a couple of years, including attending a few lectures, and some field trips. No luck yet. Your story gives me faith that I’ll eventually find them. Thank you Reed. I will be out on the Prairie again tomorrow and next week, and hope to see the owl again and hopefully closer this time. And also hope your luck improves. So happy for you to have seen and captured a photograph of this wonderful bird. As always, your pictures and the tales of your experiences and travels are what keep me coming back. I’ve only seen an owl once. Hopefully there will be more to come! Thanks Donnie! Good to hear from you.